I have never been a fan of squash. For the longest time I thought the only good use for squash was hollowing out pumpkins to make scary jack-o'-lanterns at Halloween or chucking rotten ones at passing hay rides in the fall. A couple of years ago, I tried spaghetti squash for the first time and I actually liked the dish. It was one of the first squash recipes I had eaten that wasn’t purposely made sweet, and it allowed for its natural savory flavor to come out which is why I like it so much. Since then, I have made several spaghetti squash recipes, two of which, spaghetti squash and meatballs and lemon spinach spaghetti squash have been published here. Recently my Mom made a simple acorn squash with just salt and pepper that I was reluctant to try. To my surprise, I liked the taste. I thought it was time to go out on a limb and decided to try it stuffed with one of my favorite pizzas combinations: sausage, mushroom, green pepper and onion. 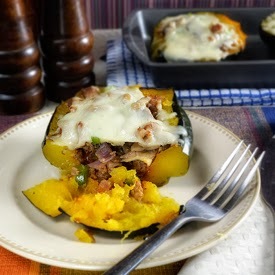 I knew that if I didn’t like the flavor of the squash I would for sure love the filling. Basically, it’s a pizza that replaced the crust with acorn squash. In the end, I was pleased with the results. It was a lighter way of enjoying one of my favorite pies. The success of this recipe has me thinking about acorn squash a little more. Could it be that squash is growing on me in general? Maybe, but I’m still a long way from craving pumpkin pie. I overcooked the squash when I documented this recipe. I should have pulled them a few minutes before I did but the time got away from me as I was making the filling. It all turned out well in the end, but the squash was so soft it was tough shaping them up for the pictures. Al dente is definitely the way to go, at least for the sake of making the stuffing part a little easier. The flavor wasn’t effected, just the texture, that is why I decided to soldier on and complete the dish, photos and all. I had funny moment later on that evening when I took these to Mom and Dad for them to have with their dinner. Mom was excited to try them but Dad wouldn’t touch ‘em. All those topping were still not enough to get him to experiment, he just doesn’t like squash. Preheat oven to 350°. Cut squash in half, scoop out seeds. Rub with a little olive oil and season with salt and pepper. Place cut-side down on a prepared baking sheet. Roast until cook through but still firm 30 to 40 minutes. In a saute pan over medium heat cook mushrooms until liquid is rendered, stirring occasionally, 6 to 8 minutes. Season at end of cooking. Remove from pan, set aside. Add sausage and cook through, stirring occasionally and breaking up chunks, 8 to 10 minutes. Move to one side of pan. Cook vegetables in empty half until soft, 3 to 4 minutes, season to taste. Return mushrooms to pan and stir everything together. Remove from heat. Increase oven temp to 425°. In cavity of cooked squash, coat with pizza sauce, stuff full with sausage mixture and top with cheese. Repeat until all squash are filled. 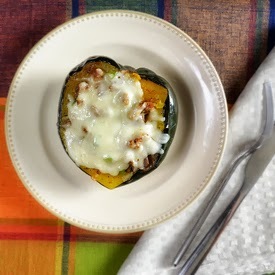 Place stuffed squash on baking sheet, place in oven and cook until heated through and cheese is melted, 6 to 8 minutes. Then serve.